Just to be sure, please confirm the text you’ve entered for your product is spelt correctly—it can’t be edited after proceeding. Add your own design to our H4 75x25mm Namebadge. 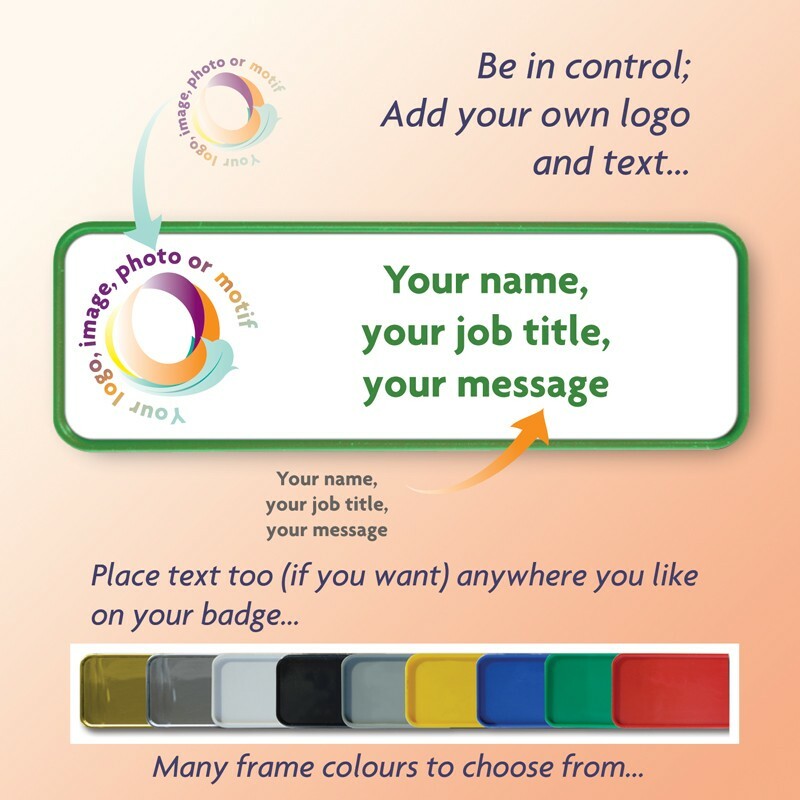 A smart namebadge with a fully customisable layout, set in a coloured frame of your choice. • A tough and robust badge that will last. • Safe rounded corners and reliable attachments make it suitable for health-care and school use. • Available with either a pin or magnet fitting. • Easy to use software gives you freedom to create and submit whatever design you like on your badge. • No software downloads - manage your design directly from our web page. Made in the UK to quality assured standards and usually turned around in three days. We've installed a simple to use and handy module on our site now that you can use to create your own name badge design. Just upload your logo into the workspace and you'll be able position, scale, rotate, shape or fade it to your own requirements. Add however many lines of text (eg. staff names and titles) you like too - wherever you want on the badge in a font of your choosing. There's even the ability to type in your namelist or upload a document that contains it. You design just the one.. we'll manufacture the many for you. Westbourne Road Works, Urmston, Manchester. M41 0TR.